With the imminent signing of the housing bill you have to wonder when the financial situation is going to improve at Fannie Mae and Freddie Mac. I think it is fair to say that the stock prices fully incorporate the lack of faith the stock market has with these organizations. If you look at stock chart for Fannie Mae you can see that stock holders have taken a huge hit. The stock has gone from about 60 to 11.5. This has been a disaster for some investors. If you look at its recent stock price history and its dividend rate, it looks like it is cheap. Is it a time to invest? I think their future is dim and here are some risks I see that may not be incorporated in the stock price. Caveat emptor! I believe that there is a serious risk that that the government will be forced to make an equity investment as part of a restructuring and wipe out the remaining shareholder equity. It is hard to envision a financial restructuring plan that does not involve a government equity investment. Although the dividend rate is a very attractive 12.1%, I think it is unlikely that Fannie Mae can continue this dividend rate with such poor prospects for earnings. Dividend rate cuts are traditionally bad for stock prices. Fannie Mae and Freddie Mac have a close relationship with the Democratic party, the former Countrywide chairman, and they were an active participant in the subprime mess. Countrywide sold their junk loans to Fannie Mae. As an exasperated Paul Gigot said in the in the Wall Street Journal article, “They were partners!” The political savvy of Fannie Mae and Freddie Mac in the past have left them with a huge political risk and a lot of bad blood in Congress. In the past Fannie Mae and Freddie Mac allegedly spent over $200 million dollars on lobbying and fighting reform that may have prevented the subprime mess. I found it interesting that last week liberal leaning journalists were wondering about the wisdom of the housing bill. It is hard to gush over “change” coming from Obama and ignore the reality that the housing bill is fatally flawed and the Fannie Mae gang is bringing a lot of political baggage with it. The wise men and woman of the Democratic party undoubtedly see a serious political risk and are probably working overtime looking for acceptable ways to spin this issue in the upcoming months. The fiscal conservatives of the Republican party see an issue they can unify the party with. If the Republican party is successful at convincing a significant number of voters that the Democratic party is primarily responsible for the mess at Fannie Mae and Freddie Mac, the more likely that these organizations will undergo serious changes regardless of the outcome of the elections. Most voters believe these organization are dirty and expect some type of reform. For some fiscal conservatives this could easily become a “holy war”. If a fiscal conservative cannot make some political points with this issue, they should give up public service and go fishing. Fannie Mae and Freddie Mac have large portfolios of bad loans. Congress via the housing bill is asking these two companies to increase the size of these portfolios. It sure sounds like Congress is encouraging Fannie Mae and Freddie Mac to relieve the banks of their bad loans. The authors of the housing bill also hoped that by providing more opportunities for refinancing, the flood of foreclosures will diminish and the price for existing homes will stabilize. 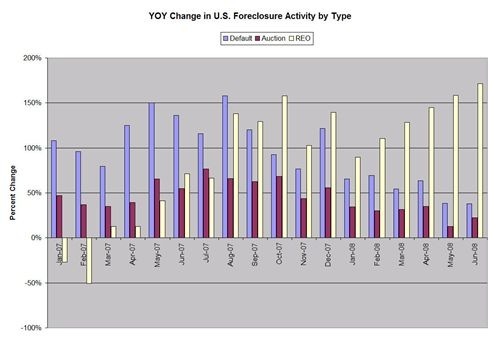 If you look at the following graph from the foreclosurepulse blog it is easy to conclude that the foreclosure rate is down over last year and most of the problem loans are now owned by the banks. This implies that most of the home owners have lost their houses and the game is already over. To increase their net income without resorting to Enron-style accounting the banks, Fannie Mae, and Freddie Mac will have to try and keep an orderly real estate market despite the price pressure caused by the huge inventory of foreclosed homes that they will be trying to sell. It would not be surprising if they blew up a few local real estate markets as they try to dispose of their inventory. All of this risk for Fannie Mae and Freddie Mac makes earnings forecasts a moot point. Considering all of their financial problems, the big question is whether these companies are already in receivership.